My story of enjoying tri-fives is very similar to most of the baby boomers in the club. Growing up, several of my relatives had the classic-bodied cars as did many of my neighbors. In most cases they became hand-me-down cars to their children the age of my older brother. You can imagine living in Kentucky winters back in the day, many of these cars didn’t hold up too well. The adverse weather and salted roads really took their toll on the bodies and floors of these cars. By the time my brother and his friends got the cars they were pretty rusted out. I remember tools kept in the trunk for the frequent breakdowns would mysteriously disappear if not anchored down, slipping out of the rotted quarter panels and trunk floors, making it interesting for drivers following behind. For all the problems the cars had—doors randomly opening on sharp curves or the occasional brake failure—there was something about the cars we just liked. Throughout the years, between my family and friends, I spent many hours working on and riding in these cars. Fast forward a few decades, I finally decided to purchase my own tri-five. But which one do I get? A tough choice—they all have pros and cons. I knew I wanted a two-door. After thinking it over for a year or so, I decided on the 1955 model. Why a 1955? A clean simple design with minimal chrome ornamentation and a fantastic interior. The car earned the famous title from GM called the “hot one” for good reason, it was. My next decision was post or non-post model. There are some club members that might disagree, but my reasoning came from my experiences with post and non-post cars of friends and family. I found that the non-post cars tended to be a real pain with regards to the window flapper opening and closing correctly sealing the window against the body. Most of them I saw were stuck and didn’t seal or close correctly. Additionally the weather stripping around the windows of non-post models always seems to have sealing issues allowing air to whistle in the car, creating additional road noise. It seemed to be an ongoing maintenance issue that I didn’t want to deal with. On the post car I found the body to be stronger and have less body flex due to the structural support the post provided. As I said, I know that some of you non-post owners might take issue with my view, but this is my opinion based on my experience. It was settled. I wanted a 1955 post car and it took a year to find the right car. Crishana, my wife and I, found the Blanche up for auction in Dallas. 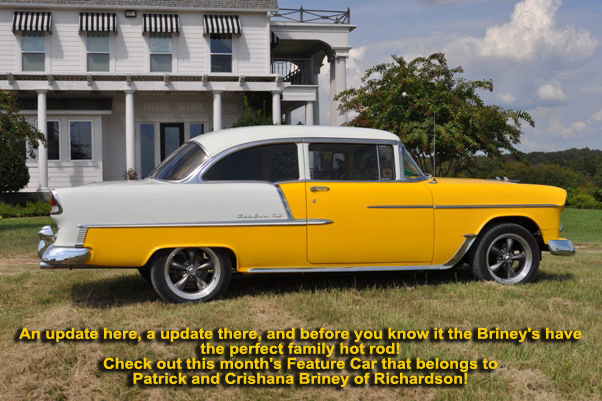 It was a 1955 yellow and white 210 with Bel-air trim. I reached out to the current owner, a dealer who was just passing the car on and he didn’t have much to say about the car’s history. I went and looked at the car top to bottom—it was one of the cleanest body, floor, and frame cars I have ever seen. Reviewing the title paperwork, I did some detective work and found out why it looked so good. The car had received a rotisserie restoration from a shop outside of Cleveland, Ohio two years prior. New sheet metal included a new one-piece floor and trunk panel. The rest of the car was fairly straight and clean. The restoration included new tinted glass, chrome, wiring and weather stripping. The front suspension was rebuilt and stock with manual steering. The interior was amazing, Ciadella Interiors in Tempe, AZ did the stunning color-matched interior. After getting the car home and looking it over even closer, I made a to-do list of the car’s needs. A tune up was needed and the carbs needed to be rebuilt. Right away new plugs, oil change and a Pertronix ignition and coil went in. Turning to the carburetors, I discovered that the back carb bowl had been damaged and poorly repaired along the way as had the linkage. Rather than fool around with the old carbs and linkage I decided to replace them with good quality replacements. I reached out to an old contact by the name of Charlie Price in Florida. He owns a company called Vintage Speed—all they do is vintage carburation setups. He fixed me up with three new carbs, a linkage, and a fuel rail. They bolted right on and the car ran well, unfortunately maybe a little too well. Due my slightly aggressive diving style, the motor gave out within a year. At that point I had a decision, what motor to put in and do I do the work myself or pay someone to do it? Do I put in another replacement 350 for a modest cost or maybe something with a little more power? After much research, I decided I definitely wanted a GM crate 350 RamJet and a new GM 4l65e to replace the Muncie 4-speed. My bad, when I bought the car I thought I would like to shift more than my knee actually does, so the 4-speed was pulled. I can’t complain about the automatic—the overdrive really helps when going down the highway. While thinking through the motor and transmission replacement, my mind moved to the old manual steering box and lack of air conditioning in the car. Being that I’d like for my wife to ride in the car between April and October, I decided this was the time to do those upgrades, too. With the laundry list of things I wanted to do, I knew that it would take me a year or more to complete it working alone. Quite frankly, I’ve noticed that as I have aged, it seems to be getting harder to crawl up and down from underneath the car. I decided to hire out the work so that I could enjoy the car sooner rather than later. Being a car guy in the Metroplex, you hear about the good and bad shops around town and having spent quite a few years in southern California, home of many rod shops, I learned to tell the good shops from bad shops pretty quickly. I reached out to Collin County Customs (CCC). Rob and Cory are co-owners of the shop. Rob had a beautiful ’55 post and Cory’s family owns a Nomad, a Sedan Delivery, and a ’57 convertible, I can tell you that they love tri-fives and know them well. I went to their shop numerous times and there was always at least one tri-five in for service. I had them install new rear leaf springs and was very comfortable with the work performed. I sat down with Rob and gave him my laundry list of what I wanted and took his suggestions for items I had not yet considered. We hammered out a price for the parts, got an estimate for the labor, and the deal was done. Tom McGee, a former DACC member works at CCC and did the majority of the work on Blanche. I can’t say enough about the quality of the workmanship put into the build on our ’55, Blanche. She is driven weekly and enjoyed by Crishana and myself. We have many future cruises planned and enjoy meeting other tri-five owners. Below is laundry list of some of the improvements in the car.